Have you ever had the urge to try growing your own food? Wanted to flex your green thumb? Like to feed your family healthy, locally grown produce? At Shearwater, residents can do all that and more at the brand new Community Garden in The Falls neighborhood. What are the Community Gardens? How do they work? Shearwater’s Community Garden is a collection of raised garden beds owned by the HOA. Residents can rent out the beds for their own personal use. Once rented, residents can choose what they want to grow, from snap peas and tomatoes to bok choy and cabbage. This provides residents with space outside of their yards to grow their own produce, exercise their green thumb and connect with nature. The Community Garden does a lot more than give residents the chance, and space, to grow their own food. They’re a way to bring people together with similar interests and forge friendships that will last long past the growing season. Residents can share produce and cook fresh, delicious meals together, or even help each other have gardening success by sharing tips and tricks. 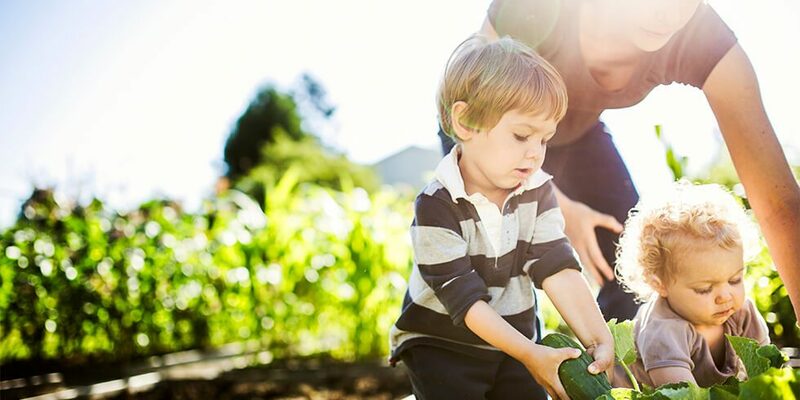 For families, the Community Garden provides a plethora of opportunities for kids to learn about where their food comes from and for the family to spend quality time together. This can help kids build healthy eating habits, teach the importance of sustainability and protecting the environment, and foster a love for nature and spending time outdoors. Shearwater offers residents a variety of thoughtfully planned amenities that foster a sense of community and encourage time spent in nature. To learn more about the lifestyle at Shearwater and everything this community has to offer, join our Interest List or schedule a tour.